HP recommend that to prevent damage to the iPAQ Pocket PC screen, you should never use any device other than the stylus that comes with the Pocket PC or a suitable high quality replacement to tap or write. 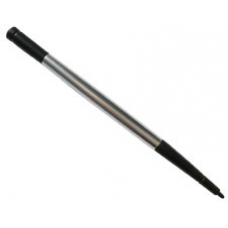 This is a high quality replacement metal stylus with a soft nylon tip, it passes all our in house requirements for use on the delicate iPAQ touch screen film. It has the added benefit of being a ball point pen and having a dedicated reset pin, for hard resetting of the iPAQ. * Fits Perfectly into the iPAQ Stylus Silo. * Unscrew the Base to Reveal a Pen. * Unscrew the Nylon Stylus Tip and the Reset Pin is Revealed. * Soft Nylon Stylus Tip Reduces Screen Wear.